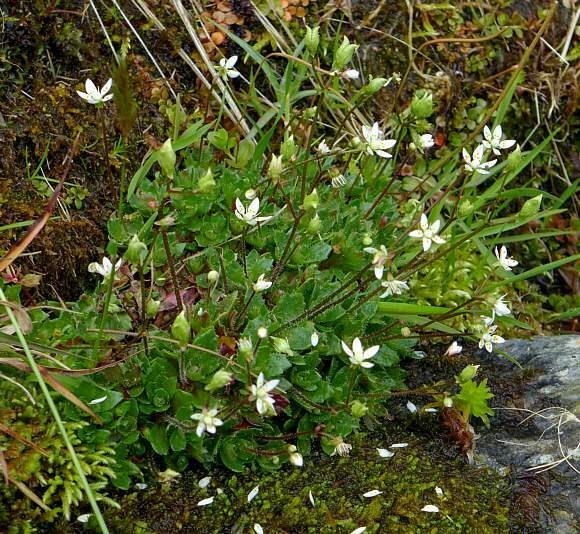 Most often found on mountain sides either on wet rock ledges or cliffs or beside mountain streams usually in sheltered nooks which are often quite dark: it doesn't like being in full sun for long. 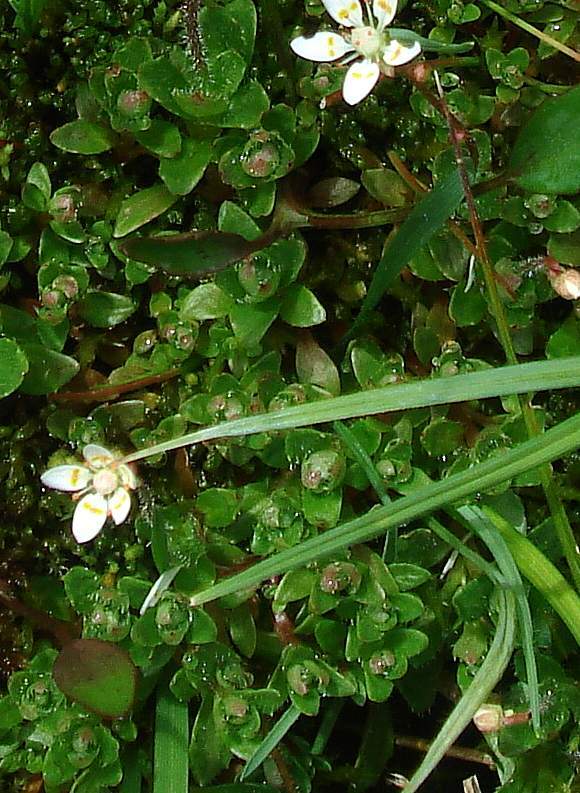 It prefers acid soils, here damp mossy. 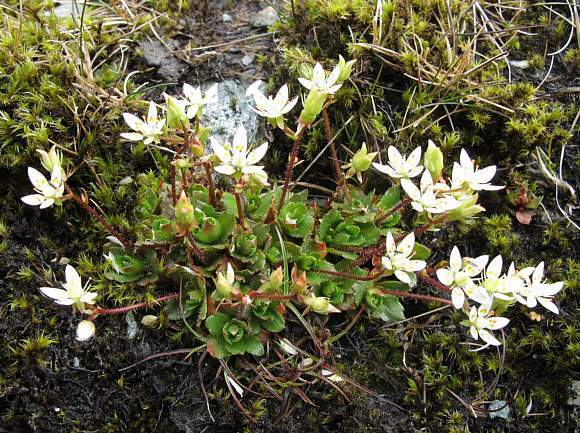 A short plant, up to 20cm high but usually half that. Nascent flower buds nestle ready to grow long stalks in the centres of circles of leaves. Just beneath branches (if there are any) are short, narrow leaf-like bracts. The 5 pale-green sepals just below the flower heads are usually reflexed downwards. But the one on the left hasn't yet opened. 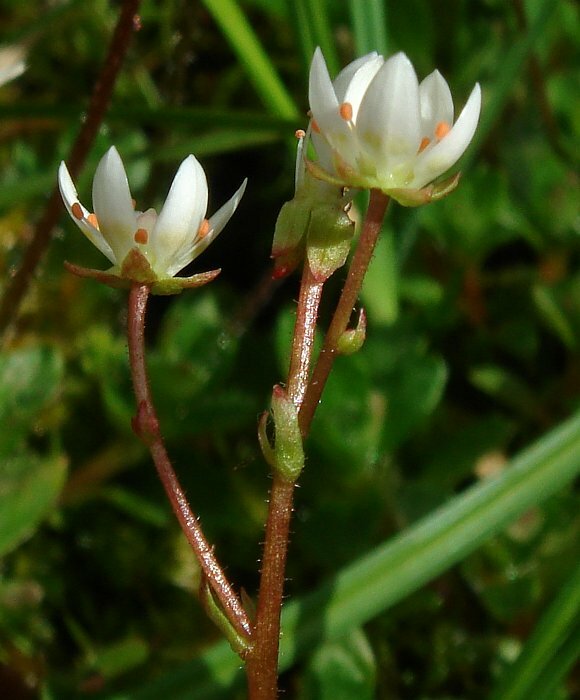 The centre flower is showing that there are actually 2 carpels in the centre, each with a stubby stigma atop. The left-most flower again displaying the 2 carpels in the centre. 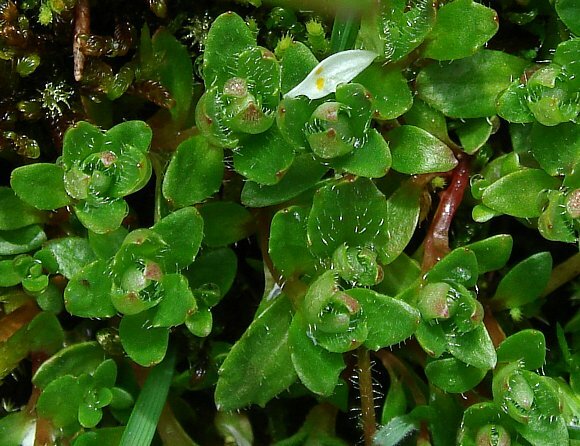 The stems are reddish and slightly hairy. 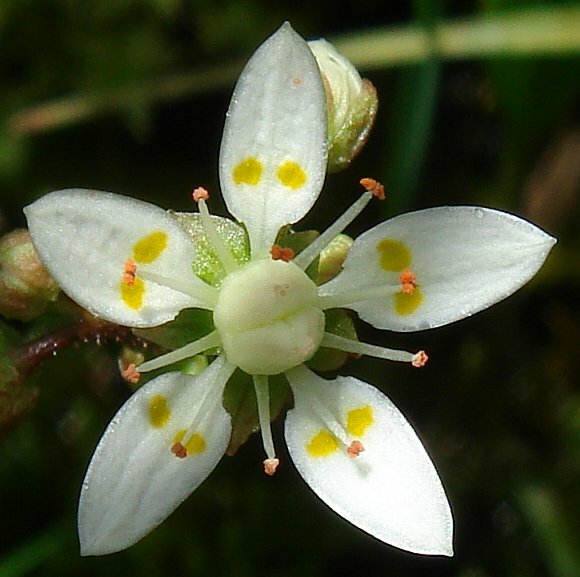 Five spear-end-like white petals each with two yellow spots. Ten anthers with orange pollen on the ends. 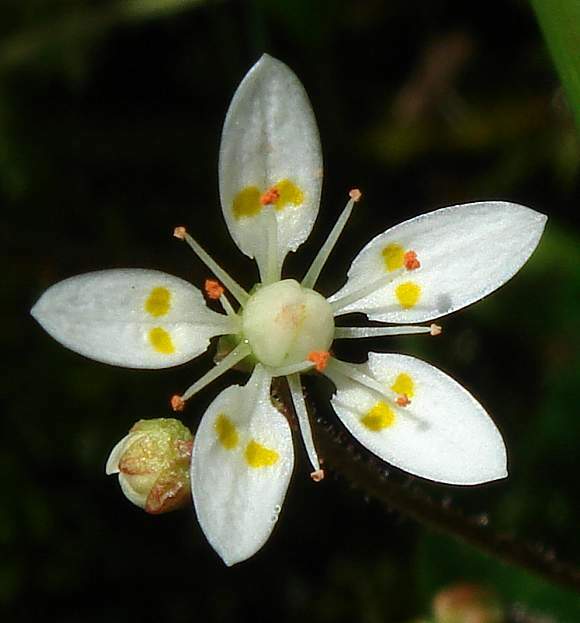 Ten white stamens splayed out with small dumbell-shaped orange anthers at their tips, 5 in the centre of the petals, and 5 in the gaps between. The 5 pale-green sepals are just behind. 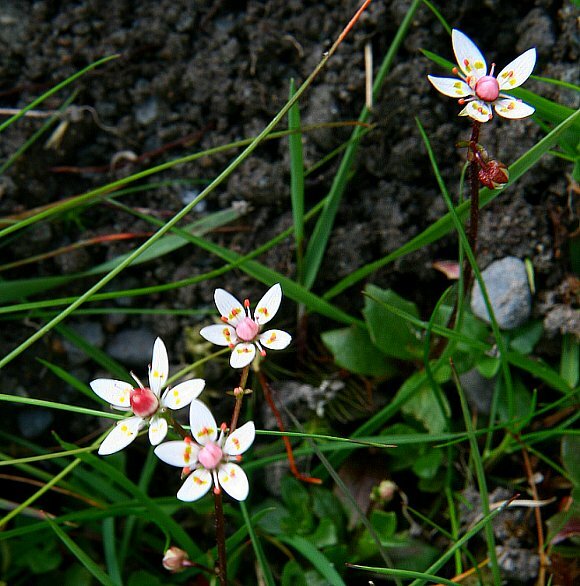 The petals are spear-head shaped. [The other flower with (indigo) spots on (some) petals is Common Stork's-bill (which can have one spot on 2 adjacent petals, but not on the other 3)]. 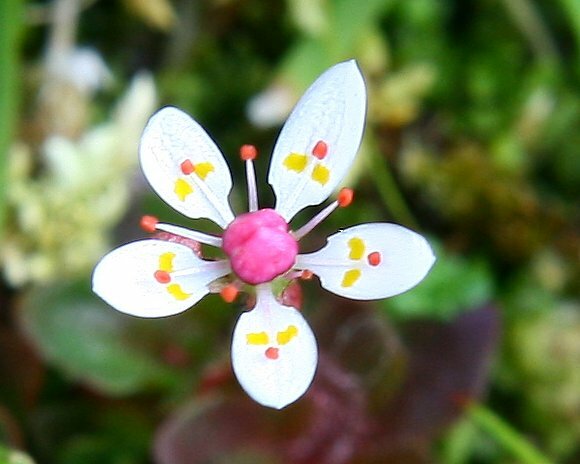 These spots on the petals confirm identity of Starry Saxifrage. Young basal leaves with sparse but long hairs. The flowers stalks have yet to emerge. Leaves oval, without stalks, toothed or lobed and between 5 to 30mm long. After a while the carpel in the centre starts to become pink then red as the fruit/seeds develop. 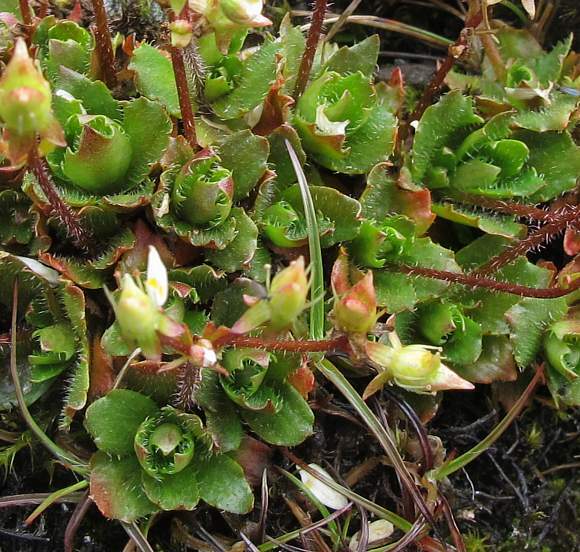 The flower stalks mostly lack leaves; most leaves are very short basal leaves which are slightly toothed or lobed. 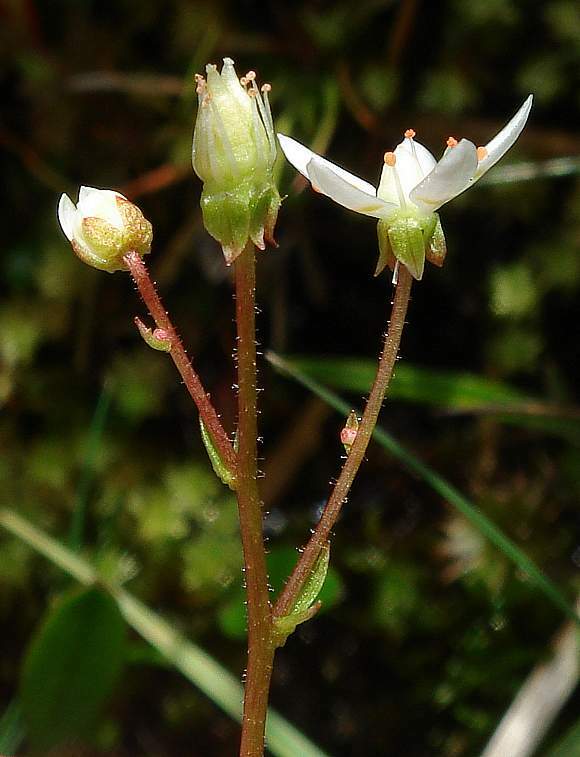 The flower stems are sparsely hairy as are the basal leaves (mainly on the upper/inner surface). Distinguishing Feature : the 2 yellow spots on each of the 5 white petals. 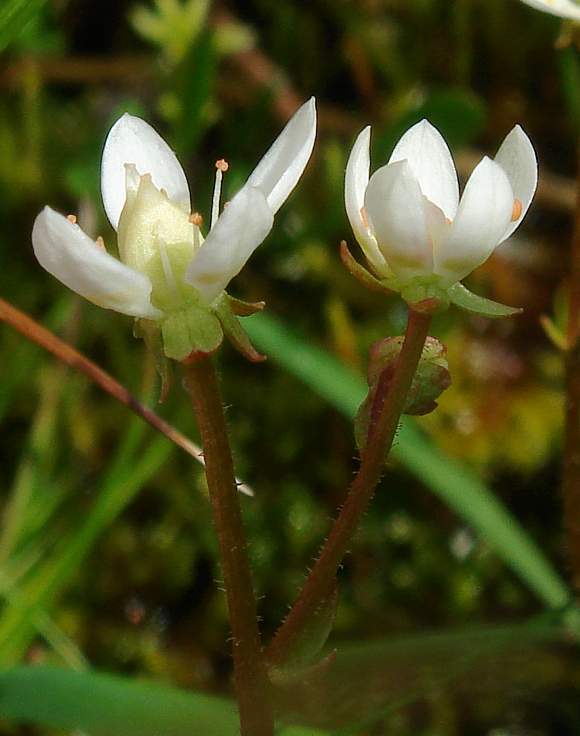 Petals end in a slightly cusped point (unlike most other Saxifrages).